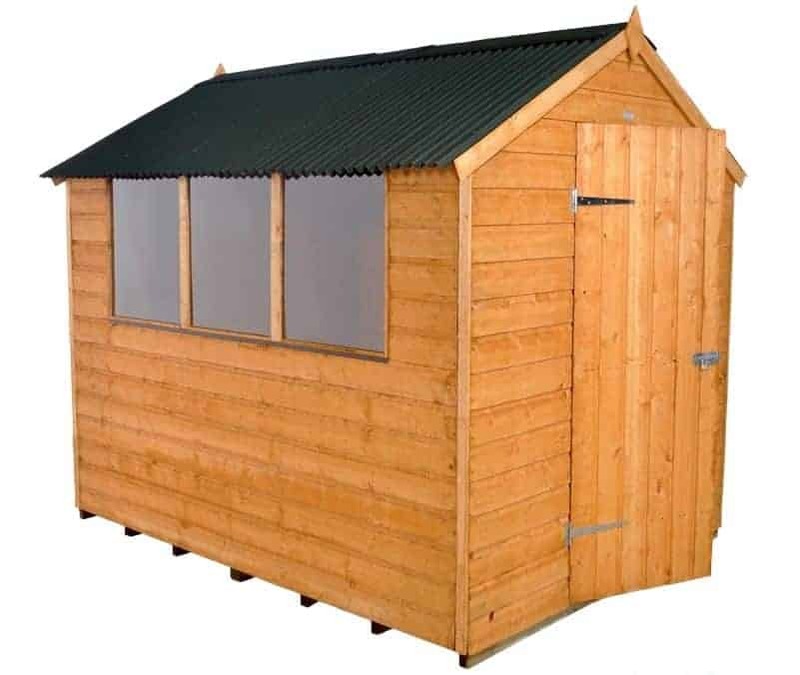 There are many different types of sheds on the market and this Shed-Plus model with onduline roof is one of the more unique designs available. It has been built with ultimate weather resistance in mind. The very durable roof isn’t just excellent at repelling water, but it is also fantastically wind proof. Not many roof designs can withstand strong winds the way this one can. It isn’t just the roof that makes this a great choice however. It also comes built from robust Shiplap tongue and groove cladding. This gives the walls a brilliant weather resistant design too. 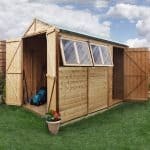 So if you’re looking for a shed that will last, this is definitely a must-have model. You are also given plenty of light to see inside the shed throughout the day thanks to the 3 fixed styrene windows. As both sides of the shed are structurally exactly the same, the windows can be placed on either of them. This choice of window placement gives you the opportunity to improve the amount of privacy you have. Compared to other same size sheds, this one does come at a slightly increased cost. However, this is justified by the exceptional features included. 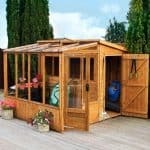 It comes with a 10 year anti rot guarantee and offers a unique alternative to the traditional style sheds out there. Unpainted design might not appeal to everyone. Coloured treatments can help you change the style of the shed to better suit your preferences. The Shed-Plus Onduline Shiplap Shed has a solid design and is built with general outdoor storage in mind. It benefits from an extra-tall build, giving you a substantial amount of headroom to easily and comfortably walk around the building. Its doors have a standard design, offering a good level of width to transfer a variety of equipment and tools. 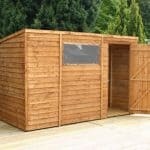 It is more of a medium size shed and benefits from being wind, as well as rain proof. This shed’s roof is its main outstanding feature. Not many sheds come with an Onduline roof so it’s understandable if you’re not even sure what this means. Basically it has an apex design, but it is corrugated so that rainwater has no chance at all of collecting on top of the building. It has a surprisingly lightweight design for something so strong. It is actually one of the most weather resistant roof types available, protecting the building from rot, rust and decay all year round. It can even resist wind speeds of up to 120 mph. As it does feature such a lightweight design, it is also very easy to just slot into place as opposed to a standard apex roof. We’re surprised that there is absolutely no mention of the type of floor used on this shed on the Shed Store site. However, it can also be found online as the ‘Forest Shiplap Shed’. It is a lot more expensive elsewhere, but the information presented states that a solid sheet floor is used. So taking into account the high quality design of the rest of the building, this is a little disappointing. It won’t hold heavyweight storage well and will require additional measures to be taken in order to strengthen it. It is known that Shiplap tongue and groove is used to create the strong, solid walls of this shed. 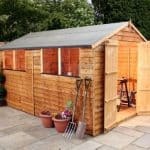 It is the best quality cladding you will find used on a wooden storage shed and comes with some pretty impressive benefits. For example, there are little grooves placed between the panels which act as a drain for rainwater. These indented grooves carry water away from the walls so that they are fully rot resistant. Then there’s the tight bond formed between the panels thanks to the interlocking tongue and groove. So compared to overlap buildings, this style of cladding is much more superior and will offer a weather resistant barrier alongside an attractive design. Standard 28mm x 28mm framing supports the interior. Like so many Shed-Plus sheds, this has been dip treated largely for protection during shipping. A high quality treatment is absorbed into the surface of the timber and stops it from warping during transit. We do recommend using your own treatment once you have built the shed and then continuing treatments annually. The single door included has pretty standard measurements and does give you a generous amount of space to get your stored tools and equipment in and out of the building. It has a ledge design and though it isn’t braced it is hinged. So sagging shouldn’t be an issue. Like many sheds in this collection, this one has a pad bolt secured onto the doors which doesn’t just stop them from opening, but it also lets you attach a padlock to secure its contents. As both sides of the shed are structurally the same, the windows can be placed on either side. There are 3 fixed windows glazed with shatterproof styrene and they offer a substantial amount of light into the shed. 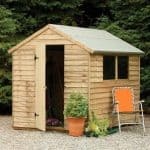 We will say that whilst initially this shed doesn’t come with a lot of security or privacy, there are upgrades you can make. For example, you can buy a pretty affordable good quality padlock to make sure the shed is inaccessible to anyone without the key. You can also add curtains behind the windows so that when you aren’t using the building, the curtains can be drawn and nobody will be able to see what’s inside. 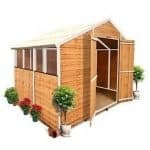 Shed Plus don’t give a lot away about this shed and they offer absolutely no extras or even recommended products which is extremely unusual. However, that isn’t to say that there aren’t ways you can customise and upgrade the building. There is one customisation option that is made clear in the product description and that is the choice of window placement. Being able to install the windows on either side of the shed gives you a number of advantages. Firstly it gives you more choice in the placement of the shed. Secondly it also lets you choose the most private side to install the windows on. You can also place them on the sunniest side of the garden to maximise the amount of light they let into the building. So it’s a great customisation option when you think about it. Whilst there are no extras offered on the product page, we would recommend looking for a padlock. A strong good quality pad bolt has been supplied and all it needs to keep your storage secure is a good quality padlock. Shed Store do supply numerous high quality padlocks so it’s definitely worth taking a look. The corrugated onduline roof definitely gives this shed a higher quality rating than most of its competitors. However, the use of a solid sheet floor does make the overall quality of the building slip a little. The roof once again contributes massively to the longevity rating. It is guaranteed to prevent the roof from rot, rust and decay for the entirety of the sheds life. However, the walls will need treating annually to provide protection against the weather. There are larger sheds available, but this does seem to be the most popular size on the market. It offers a generous spacious interior and the Shiplap walls allow you to install shelving too. This is one of the easiest 8’ x 6’ sheds to assemble. The roof has a lightweight design and it easily just slots right into place. It actually cuts down the installation time by two thirds according to the manufacturer. When you look at the extreme weather resistance offered by this shed you realise you are getting fantastic value for money. However, you may need to strengthen the floor and add a padlock so this is taken into account, along with the yearly treatments. Final Thoughts: The onduline roof on this shed is by far its best feature. Offering an outstanding barrier against the elements, this roof ensures the shed lasts for many years. What we like about this particular model is that it still gives you the same benefits as a standard apex building, but it also adds a little something extra. Add to that the fact it comes with a 10 year anti rot warranty, 3 fixed styrene glazed windows, floor bearers, a solid Shiplap cladding and the walls have been dip treated and you soon realise you are getting excellent value for money.